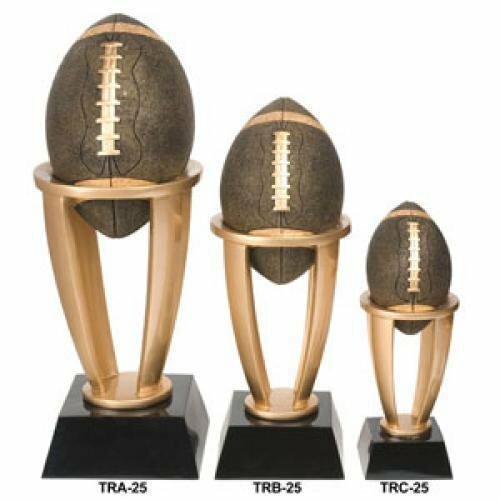 Dynamic lines are the hallmark of this Football Star Award. The unique star design of the football played is shown with the football carefully tucked under his arm and running for the game winning touchdown! The regal black base forms a rounded shape to complete this award. 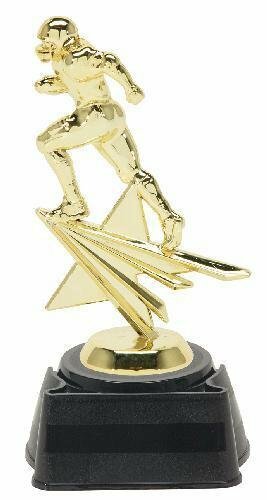 This award stands 8 1/4" tall and has plenty of room for whatever your personalization needs might be. After you have added this item to your cart, you can modify any of the parts for any sporting or academic activity. 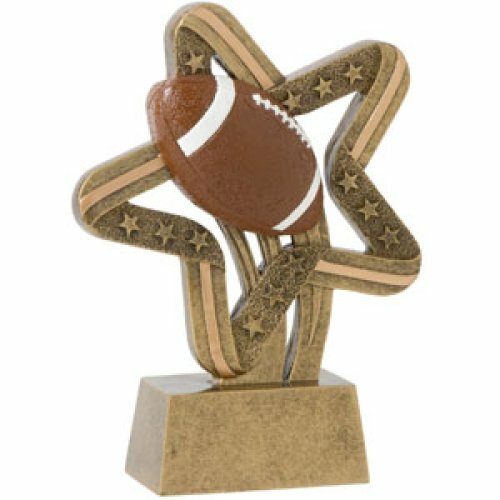 Stars, stars, and more stars make this Football Stars Trophy a one of a kind. The football player on the top of the trophy has the ball safely tucked under his arm and is running to score the winning touchdown. The full color football including detailed white finger stitching at the top of the star riser sets a dynamic tone for the overall award. The black marble color finish base completes this award and has plenty of room for any of your engraving needs. Brilliant colors highlight this unique football street tag. The street tags are on a highly polished black finish. 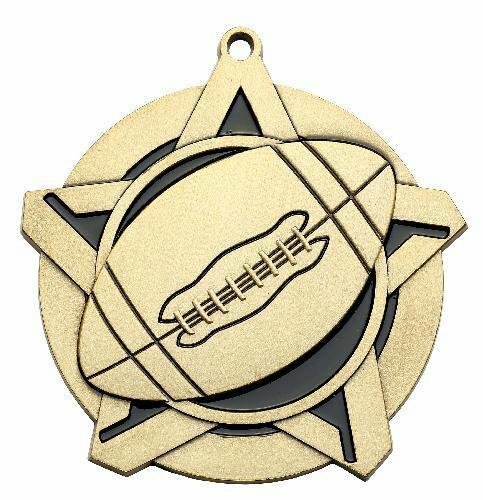 Set in the center of the tag is an outline of stars with red flames that are set behind a brown football with white finger stitching and the word "Football" on opposite sides completes the award. This item measures 2 1/2" X 1 1/2" so it has plenty of room on the back for what ever personalization you require. 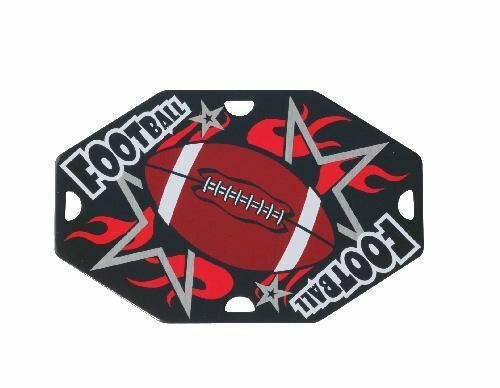 The football street tag can be given as either a key chain or a neck worn award providing you the ultimate in flexibility. A textured banner backs a diamond covered in Sun Rays and featuring 20 different sport and academic themed designs on this distinctive resin award. The base is highlighted with a gold star and has plenty of room to personalize for your event to recognize achievement. Each themed resin is availabie in 2 sizes to meet your award needs. 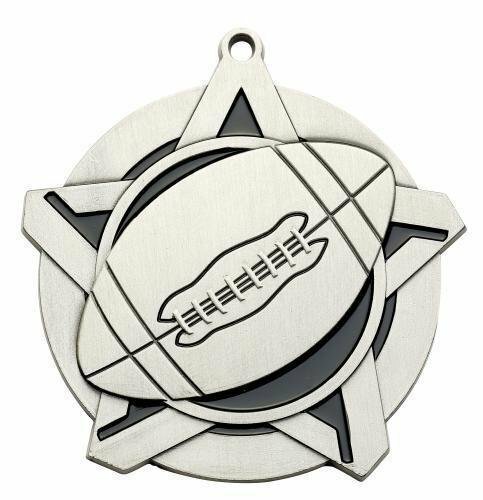 These Football Super Star medals have a decorative star that frames the center of the medal. 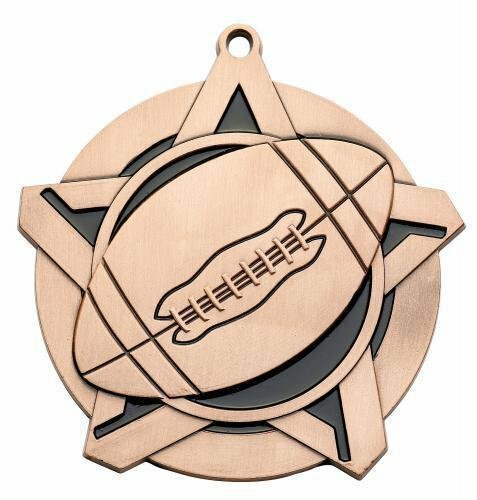 A football complete with finger stitching fills the front of this 2 1/4" in diameter medal. In addition to many other sports or activities these medal come in your choice of gold, silver or bronze finish. The back of the medal has more than enough room for all of your personalization needs. All you need to do is pick a ribbon and you are all set to go! Two large shooting stars frame a runner about to score that winning touchdown on this 6" silver resin trophy. The base has a large space for a plate personalized for your event to recognize and honor achievement on the football field.